Classic, unique, or totally modern – solitaire rings let your diamond take center stage. And if there’s anything we love more than this can’t-go-wrong setting style, it’s your glowing reviews! 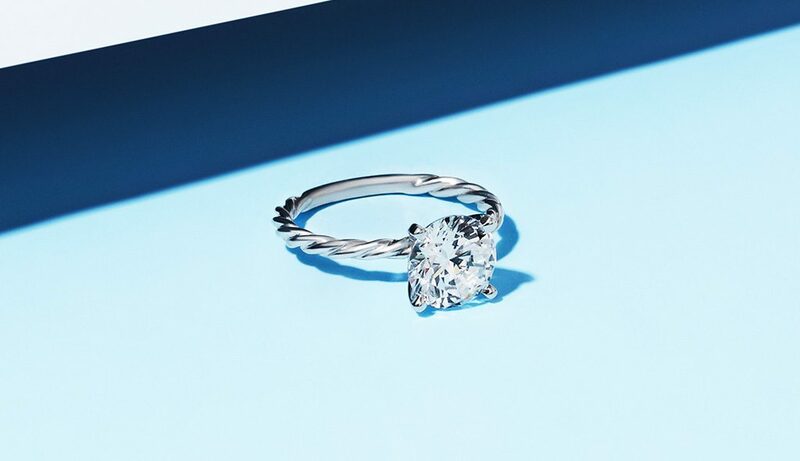 To keep it real, we’ve rounded up our top 10 solitaire engagement rings according to you. “Selection of it, the time till delivery (during a holiday period of time), her reaction… It was all perfect!”- David W.
“She loves the thin band and thinks that it is the most beautiful piece of jewelry ever.”- Erik D.
“Really over the moon. Had so many positive comments. Not least from my fiancé who LOVES it!”- Micah V.
“Simply stunning and very impressed with the presentation. The ring is amazing.”- Kennedy D.
“The rope setting has an elegant yet distinctive simplicity, and it really highlights the diamond. If you’re looking for a traditional style engagement ring, but don’t want it to look like every other engagement ring, this is definitely the setting to go with.”- David B. “The only thing I was not nervous about that night was about how much she would love the engagement ring. It was perfect.”- Guerrero G.
“It’s simple, elegant, and beautiful.”- Juan M.
“It features the diamond in a beautiful gallery from all angles. The diamond sits low on the finger yet there is an illusion of a cathedral setting with sides tapering up to the stone. The under gallery is perfectly finished and polished. Superb craftsmanship.”- Chris T.
“She said, ‘Yes!’ before I could even propose… She liked that the diamond only sat a little above the ring because she’s a hair stylist, she didn’t want her ring to be caught in peoples hair and she loved the width. It wasn’t too skinny; it wasn’t too big; it was just right.”- Clinton A. “The ring was elegantly designed and reflects expertise and and hardwork from the maker. Excellent job!”- Louie I. “I get compliments all the time. And the diamond… OMG, is BEAUTIFUL and it sparkles for days. It’s not the normal solitaire; simple, yet different… very elegant.”- Lisa P.
“My gorgeous woman said yes! And she absolutely loved the ring. The engravement is beautiful and the ring is nice and sturdy… I absolutely recommend it.”- Aldo G.
“The ring is set with perfection and attention to detail. The bands are petite and the basket has a low profile. The claw prongs are small and symmetrical. I highly recommend.”- Gianna K.
“Was looking for something simple with a little uniqueness. This was an ideal choice. The design and materials are superb, and people are always asking what the style is called.”- Kiefer E.
“It put a modern twist (pun intended) to the ring. She absolutely loved it!”- Daniel A. “The cable band offers the ring a sense of daintiness to it.”- Danielle L.
“This band is simple, elegant, and in some way looks very traditional with a vintage style to it without doing too much to draw attention to itself (sometimes less is more).”- Stephen L.
“Really liked the simplicity of the top and the intricacy of the etching and milgrain.”- Joshua R.
“Lovely etched detail. I get compliments about it every time! Fits amazingly and sparkles!” Sarah T.
Inspired by these top 10 solitaire engagement rings? Ready to rock? 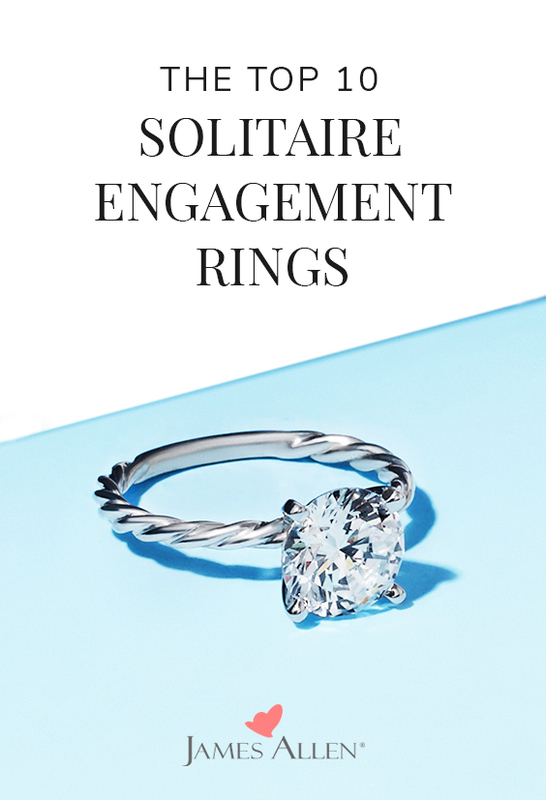 Learn more about timeless solitaire diamond rings, find your partner’s engagement ring style, see the best engagement rings for active lifestyles, or start with buying an engagement ring 101! Obsessing over one (or more) of the solitaire rings in this post? Share the love on Instagram, Facebook, Twitter, Snapchat, or in the comments below!